Creating recycled concrete product from residual byproducts associated with additive manufacturing technologies. 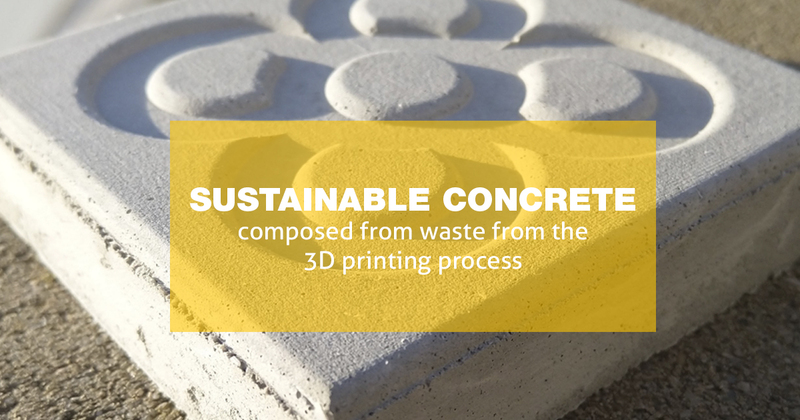 This is what we have been able to achieve by creating a new system which gives new life to the waste products such as microplastics, agents, dyes, and the leftover glass spheres and aluminum oxides from the postprocessing of the 3D printed parts, to generate a new form of hybrid concrete that gives a new sustainable alternative to the construction industry. Named Project BCN, the principle arose from the idea that while additive manufacturing permits the rapid fabrication of parts with a reduced quantity of toxic byproducts when compared to traditional methods, it does create a substantial amount of non-biodegradable waste. A fact of which is only recently coming to light, and that we aim to directly address, giving new life to previously unusable material and waste, reducing dramatically industry’s ecological foot print. This is why the company has dedicated several months of research and development to develop a system in which all its’ excess waste generated from its’ additive manufacturing processes is collected and reused. Project BCN also finds a solution to the issues caused by the cement industry. According to data from the OECD, it is estimated that the concrete industry uses over 27 billion tons of sand and gravel, which is a rate higher then what the earth can logically sustain, provoking the loss of natural beaches and erosion. At the same time, the cement industry is responsible for an estimated 7% of global C02 emissions. In order to create this new form of hybrid concrete, the engineering company based in Vilassar de Dalt, Barcelona has developed a machine which uses a large amount of 3D printed components to optimize the process and insure the correct mixture of material necessary automatically. The resulting product has been tested in 3D printed moulds, the designs of which have been inspired by the modernist works of Josep Puig i Cadafalch, found throughout the city of Barcelona. The mechanical resistance of the final products equivalent to its normal concrete counterparts, while using a high percentage of microplastics and waste. Project BCN is currently ready to enter a second phase, in which we are currently negotiating with possible partners to bring this new product to market on a global scale.